On February 19, 2016 Prince William County Police officers (Criminal Investigations Division-Violent Crimes Bureau) were recognized for their tireless effort and commitment to support the ACTS Local Outreach to Suicide Survivors (LOSS) Team. 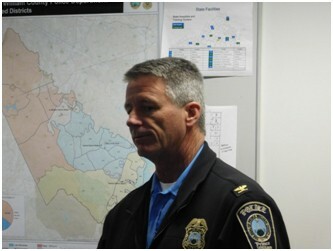 Whenever there is a suicide in Prince William County, law enforcement calls ACTS to mobilize the LOSS Team. Within an hour, our staff or trained volunteers are on site at the family’s home to provide comfort and support. Briana Sewell presented Commendations from the office of Congressman Gerald E. Connolly. The following officers’ names have been entered into the Congressional Record: Dan Carton, Brian Cavanaugh, Brian Coady, Darien Cupka, Dan Downey, Mike Fernald, Ben Grantham, Ray Hyatt, Rob Kasper, Joe Medawar, Juan Pena ( deceased), Gina Pinedo, Astrid Robinson, Caillen Smith, Mike Sullivan, and Gary Van Dyke. During the luncheon, Chief Steve Hudson (Prince William County Police) and Steve Liga, CEO of ACTS, highlighted the benefits of the four year partnership. We appreciate Chief Hudson for his leadership and the officers who serve our community. Also, thank you to the dedicated, compassionate LOSS team volunteers who are available to provide onsite support and resources to families bereaved by a suicide loss. You are a gift.